Roaring Brook Press, 9781596439757, 32pp. 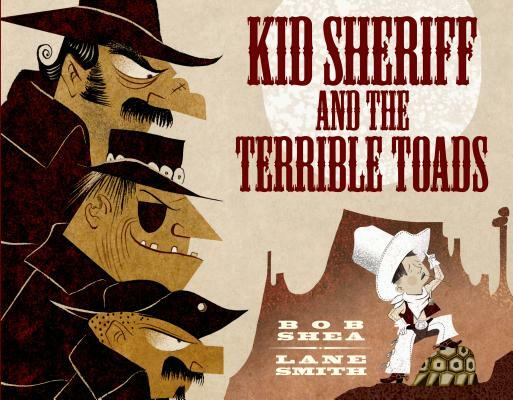 Bob Shea has written and illustrated more than a dozen picture books, including Dinosaur vs. Bedtime, and is the author of Kid Sheriff and the Terrible Toads and Big Plans, both illustrated by Lane Smith. His writing career began at Comedy Central, and his characters and animations have appeared on Nick Jr., Playhouse Disney, and PBS Kids. Lane Smith has written and illustrated a bunch of stuff, most recently There Is A Tribe of Kids, which is set to launch in Summer 2016. He is the author of the middle-grade novel Return to Augie Hobble, as well as author and illustrator of Grandpa Green which was a 2012 Caldecott Honor book and It's a Book which was on the New York Times bestseller list for over six months and has been translated into over twenty languages. His other works include the national bestsellers Madam President and John, Paul, George & Ben. His titles with Jon Scieszka have included the Caldecott Honor winner The Stinky Cheese Man; The True Story of the 3 Little Pigs; Math Curse; and Science Verse. Lane's other high profile titles include Hooray for Diffendoofer Day! by Dr. Seuss and Jack Prelutsky; The Very Persistent Gappers of Frip by George Saunders; Big Plans by Bob Shea; and James and the Giant Peach by Roald Dahl. In 1996, Lane served as Conceptual Designer on the Disney film version of James and the Giant Peach. His books have appeared on the New York Times Best Illustrated Book of the Year list four times. Lane and book designer Molly Leach live in rural Connecticut.